← What do You do When you get Reverse 911 while on Vacation? We had often watched nature shows where scuba divers described how incredible it was to swim alongside giant whale sharks and thought that swimming with whale sharks would be a good addition to our “bucket list.” While planning a trip to Borneo this spring, we discovered that the largest concentration of whale sharks in the world can be found off the coast of the Philippines, a mere 2 hour flight from Borneo (then from Manila, it is a 45 minute flight to Legaspi and an hour drive to Donsol). Looking into it further, we found a local dive company that conducts 4-day whale shark tours to the area. The excursion was quickly booked. Whale sharks can grow up to about 40 feet in length and weigh up to 15 tons. They have wide flat heads with a mouth that can be up to a yard and a half wide and with very small eyes low on the side of their head. Whale sharks are a dark grey color with rows of white spots (the spot pattern is unique to each whale and is used by scientists to identify individual sharks). After a quick flight from Manila to Legaspi and an hour-long van ride on a winding, crowded, two-lane road, we arrived in Donsol around lunchtime. Because whale shark interactions are highly regulated in Donsol, we were required to watch a video about the do’s and don’ts when swimming with the sharks. For example, touching a whale shark is absolutely forbidden and will result in disqualification from further encounters. The only real danger posed to man when swimming with whale sharks is getting hit by their very large and powerful tails so we were cautioned to stay clear of their tails. After checking into our resort rooms, we quickly changed into our swimsuits, gathered our snorkeling gear, and headed to the beach to await our boat. 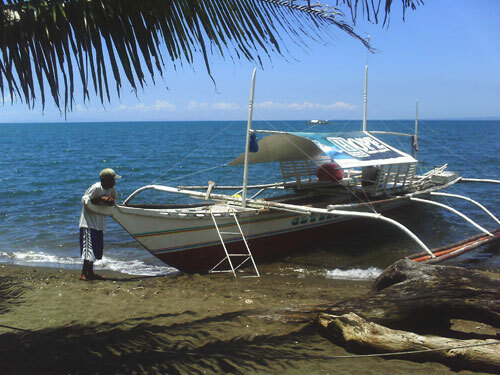 A small wood boat with outriggers on both sides and a protective sun tarp over the seating area arrived in front of our resort. Aboard were the boat captain, a whale shark spotter, and a Butanding Encounter Officer (“BEO”). The six people in our tour and our guide boarded the boat and we headed out into the bay. Our spotter, perched on a mast platform, was on the lookout for dark shadows in the water – the telltale sign of a whale shark. We weren’t cruising the bay more than a half an hour when the first shark was spotted. We quickly put on our snorkeling gear and eagerly sat aside the boat awaiting the signal from our BEO that it was safe to jump in the water. The boat captain maneuvered the boat well in front of the whale shark and cut the boat engine. Finally, the BEO shouted “go” and we jumped in the water and quickly followed the BEO away from the boat. Then he told us to stop swimming and look down. 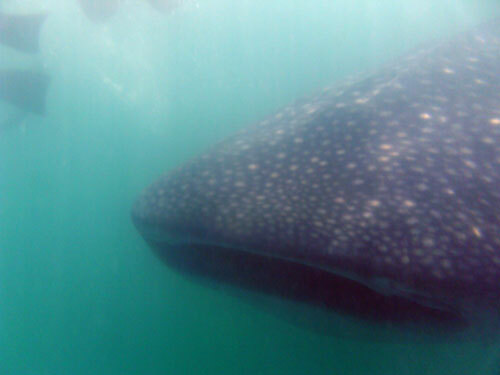 The water visibility in Donsol wasn’t more than a few feet given the high concentration of plankton in the water, the primary reason that whale sharks congregate in such large numbers there. We treaded water looking into the depths when all of a sudden, directly beneath us, the leviathan slowly appeared with its massive mouth wide open. I can’t begin to describe what it felt like to have such a large fish swim within touching distance. With adrenalin coursing through my body, I felt like I was right on top of the whale shark and that if I didn’t quickly move, I would be sucked into its gaping maw. Right or left . . . I couldn’t decide which way to go. I finally moved aside and started swimming alongside the huge whale shark, within 3 feet of it. The whale shark effortlessly swam along and then as suddenly as it appeared, it dove deeper and was gone from sight. That first day and for the following two days, we spent 3 – 4 hours a day on the boat and had encounters with 15 – 20 whale sharks per day. Each encounter brought with it the same sense of excitement. Sometimes the sharks would quickly dive to deeper water and the encounter wouldn’t last more than a minute. But several times, the Butanding was comfortable with us in the water and continued to slowly swim just under the surface. We just rolled over on our sides and with our faces in the water were able to swim alongside the gentle giant for up to 5 minutes. These encounters were truly awe-inspiring as well as exhausting! I certainly wouldn’t recommend this adventure to anyone who wasn’t a good swimmer and completely comfortable in the water. Tourists are quickly discovering the secret of Donsol. 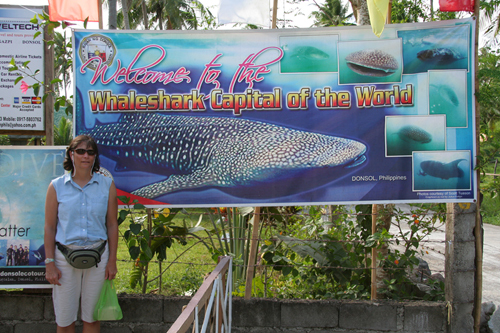 The number of tourists visiting this “Whale Shark Capital of the World” in 2008 was more than double the number who visited the year before. I can only hope that the wildlife agency in Donsol continues to regulate the industry to ensure the safety of these wonderful creatures so they will continue to feel at home in these waters. If you are interested in an adventure trip like this, or have something else in mind, contact us at Off Trail Travel and we can help you plan the adventure of a lifetime! This entry was posted in International Travel, Travel Inspiration and tagged adrenaline rush, adventure, butanding, Donsol, international travel, Philippines, swimming with whale sharks, whale sharks, whalesharks. Bookmark the permalink.